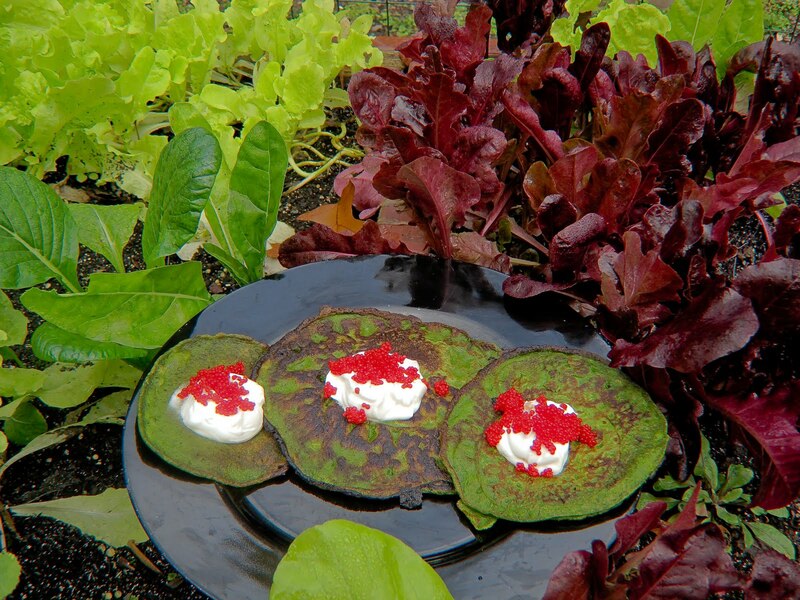 In honor of World Food Day, I made Swiss Chard Pancakes and shared them at work. I was listening to the Splendid Table on NPR on Saturday and thought all of the recipes sounded really yummy. I was getting hungry just listening. Vietnamese Pho was just what I wanted, but didn’t have the time or ingredients at hand. But I did have Swiss chard ready to harvest and couldn’t wait to try out this recipe. Dorie Greenspan’s recipe for Swiss Chard Pancakes makes 40 pancakes. I cut the recipe in half but it only made about a dozen 5 inch pancakes. I served them with a dollop of creme fraiche topped with red caviar. Blend milk, flour, eggs, onion, garlic, parsley, salt, pepper, and thyme in a blender. Tear leaves from chard stems and mid ribs and add to blender. Heat about 1 tablespoon of peanut (or other oil of your choice) in non-stick skillet. Swirl in pan to coat bottom. Pour about 1/4 cup of mixture into pan for each pancake. I could fit 3 pancakes at a time into my pan. Flip after about 3 minutes when top looks dry and bottom is lightly browned. Cook for another minute or 2 until other side is lightly browned. Remove and keep warm until all pancakes are cooked. Add more oil to pan as needed. Serve as-is as a side dish. Or you can top with a dollop of creme fraiche and a little bit of red lumpfish caviar for a real treat. Looks great too!